When I was a child we frequently visited the home of my parents' friends, Joe and Florence Schneider. After saying hello, the next thing I did was run upstairs to the boys' rooms to see if there were any new toys. While going up the stairs I enjoyed looking at the "pictures" on the risers of the stair runner that Florence had hooked. Each riser had a different self designed depiction of something from their lives. I loved it. As a young adult I became a collector of antiques and eventually also a dealer. Textiles were always a special love of mine and so I became very familiar with samplers, fancy work, hooked rugs, hand woven coverlets, etc. When supplies for doing counted thread cross stitch became available in the area, I readily took on that hobby and for about ten years I stitched designs from kits and books, and samplers of my own design. I was interested in rug hooking but the problem was that I was not able to find any sources of material or information in this area. 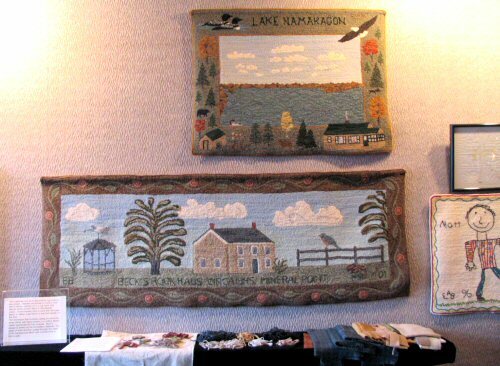 In the mid 1980s I finally treated myself to a rug hooking camp in Maine. There, along with eight other women I learned the craft and bought some simple supplies (hook, backing, wool cutter, appropriate scissors and some packages of dye) and tried to continue at home. The hobby languished until 1990 when I serendipitously met some rug hookers from the Madison area who invited me to join their monthly meetings. 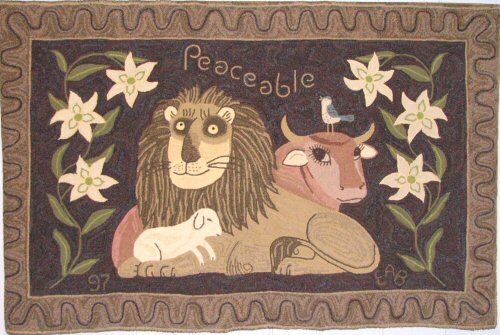 One of them had attended a new rug hooking camp in Vermont and so several of us went there in June of 1991. That experience really motivated me. I find the process of making a rug almost more enjoyable than the finished product. I enjoy hooking my own designs as much as commercial designs. My style is considered primitive because of using the wider cuts (up to 5/8 inches wide) and more naive designs. With primitive, there are no rules of perspective or realism. Animals can be any color and flowers are often forms not found in nature. These fanciful flowers are known to rug hookers as padulas. Shading is accomplished by using different pieces of fabric rather than a subtly dyed piece. Textured or patterned wool adds to the primitive look. The same design becomes unique just using different colors and textures. In June, I will return to the Green Mountain Rug Camp in Vermont for the 13th time. I have begun the process of designing a pattern (a medieval town) and choosing fabrics from a rather vast "collection" of recycled and new wool. Some I will use ''as is" and others I will over dye. Color planning is said by some to be the most important part of making a rug. Technique and pattern are second to that. Sometimes reverse hooking is necessary. That's the term we use for ripping out and re-hooking. Eventually, the rug gets done but even before that, another rug to hook comes to mind.